This item is no longer available, contact us for more information. 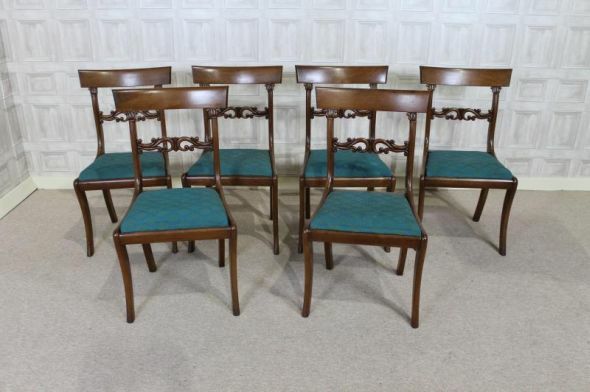 A magnificent set of mahogany William IV dining chairs. This set comprises of six side chairs and one matching carver chair. The chairs are all in superb condition, and are in a nice mellow mahogany colour. There are very small and minor defects which are clearly shown in the photographs. With their drop in seats, they can easily be re-upholstered to suit your interior. This is a rare set of William IV dining chairs in very good condition; ideal for any period property. Please read our full Terms and Conditions. Please select an option to be notified of new stock. Subscribe to our newsletter for free and get notified of sales, special events and promotions. © 2019 Peppermill Antiques Ltd | Peppermill Interiors is a trading name of Peppermill Antiques Ltd.